As a boy, Josh Sundquist was diagnosed with a rare form of bone cancer and after a year of chemotherapy treatments, his left leg was amputated. By the age of 13, he was cured of the cancer and later in 2006, became a member of the U.S. Paralympic Ski Team. Off and on for the past few years, Josh has made clever Halloween costumes for himself highlighting the “lemons” he was handed. In 2010, he was a partially eaten Gingerbread man with a “broken off” leg and in 2012, he dressed like the Leg Lamp from A Christmas Story. 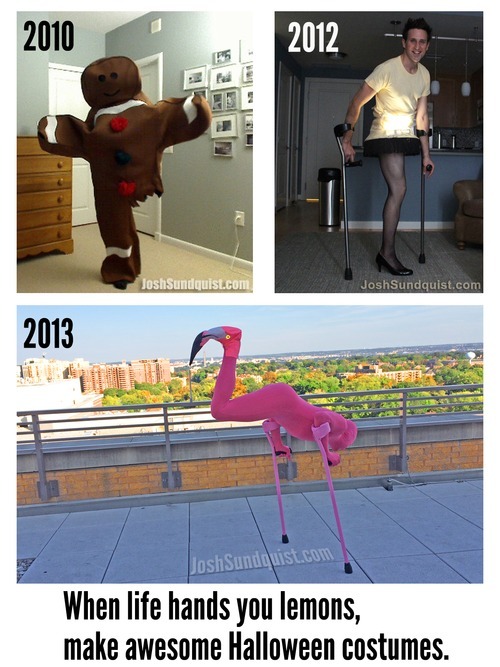 This year he has really outdone himself by donning a pink Lycra bodysuit and hoisting himself up on arm crutches to become a flamingo. Inspiring!